I called in today to the Royal Historical Society of Victoria, where they are showing an exhibition called “Melbourne Theatres in Transition: 1840 to 1940s An Idiosyncratic View”. This small exhibition at the RHSV has pictures, programs and clippings relating to Melbourne’s theatre industry from the earliest days of the Port Phillip settlement up to the war years. In his book London, Peter Ackroyd described the palimpsest effect of multiple reincarnations of the particular urban functions found in cities. Markets, eating places, theatres, charities often tend to be located in particular places, and are constantly renewed as older buildings and enterprises are replaced by newer ones, offering much the same wares. This is largely true of Melbourne’s theatre district. Theatres particularly in Bourke Street and Exhibition Street were built, knocked down, burnt out, then replaced again. My attention was attracted to a small scrap book that had press clippings about theatre in Melbourne. One unattributed clipping looked back fifty years and described the entertainment at Cremorne Gardens in Richmond to celebrate the first anniversary of the Eight Hour Day. 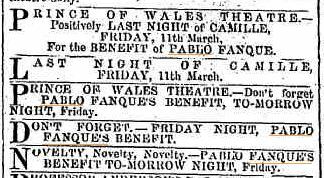 Among the acts described was ‘Pablo Fanque’. The original circus poster from which the inspiration for the song was drawn. 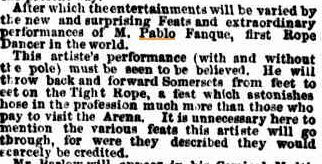 Pablo Fanque was the first black circus proprietor in Britain. He was born in England in 1796 and operated his circus for over thirty years. 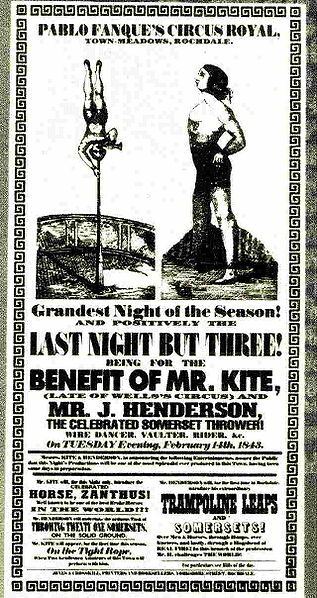 His own acts included rope dancing and equestrian feats. He toured England , Scotland and Ireland. But did he come to Australia? He was certainly advertised as being here…. But, alas, it was not THE Pablo Fanque. Instead it was his nephew Billy Banham, who took his uncle’s name and toured Australia and New Zealand in the 1850s and 1860s. This is the Pablo Fanque who appeared at the Cremorne Gardens (interesting article about the gardens here) and this is the Pablo Fanque for whom a benefit was held in March 1859. Somehow I think that they really, really, wanted you to attend. The Melbourne Theatres in Transition exhibition is on at the RHSV, corner a’Beckett and William St until 31 August. Open 10.00-4.00 Monday to Friday, gold coin donation.